Wilbur the pig is the runt of the litter, saved by the farmer's daughter, Fern, she raises him until he is sent to her uncle's farm. Although Fern visits him most days, Wilbur is lonely and asks for a friend to keep him company, he gets one in the form of Charlotte, a large grey spider. As it becomes clear that Wilbur is destined for Christmas lunch, Charlotte comes up with an ingenious idea to save him. This touches upon some serious issues for a kids book, death; which is spoken of frequently, friendship and making sacrifices for those you love but most of all that life is precious no matter how long or short your time is here. 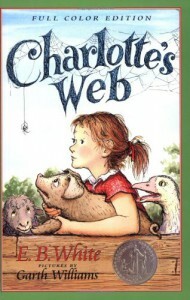 A wonderful story for both children and adults and probably the only time I will even cry over the death of a spider.